As we head into winter, some of us are going to get lots of snow, while others are going to get lots of rain! As it’s much easier to protect your hay stack against snow, I’m going to give you my fail-safe method for protecting against rain and damp – which of course will protect equally well against snow. I know, I already did a larger article on Storing Hay So It Never Gets Moldy. But as there was so much information in that one, and many people don’t need to store hay long-term, I wanted to do a real short and sweet picture tutorial here for those of us in rainy climates – who have to be extra careful about mold and damp – and who only need to store a few tons of hay at a time. After a few winters experimenting with different storage parameters (closed or open structure, cement floor, rubber mats, dirt floor, etc.) I’m going to give you a tried-and-tested way to store your hay – for the least amount of money and effort! This method is for those of you who have to order hay every 1-4 months, so your hay stack is sitting there for 4 months or less. 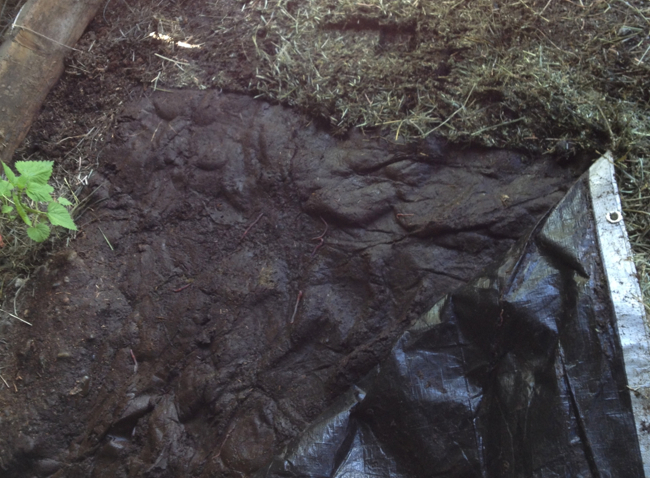 So just having 1 tarp on the ground and then pallets on top of the tarp, might be okay for a few loads of hay if you have a fast turnover and live in a dry climate, but if you are storing hay for longer than a month or two, in a rainy climate, that mold is going to start infecting your new hay. 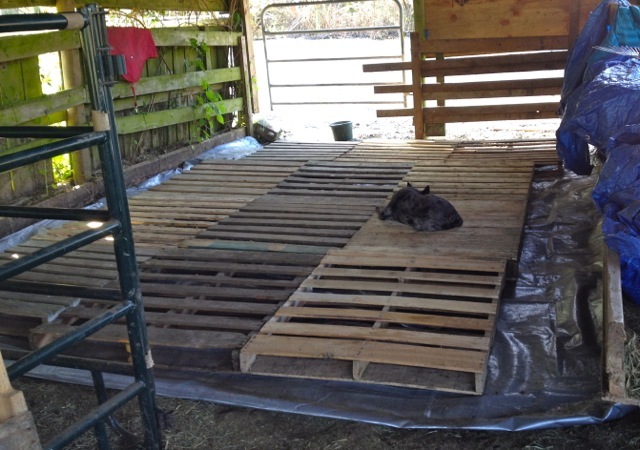 Then put your clean, untreated wood pallets (make sure there is no mold or hay inside the pallets) down on top of the base tarp. Note how I have left extra room on the right hand side – this is so that my Belgian mare can’t reach across and rip into the hay stack! You may think this second tarp on top of the pallets is not essential. I know a lot of forums etc. say you can just use one tarp on the bottom and then stack your hay right on the pallets. If you lived in a dry climate, you could probably get away with that, BUT, you are still going to lose a surprising amount of hay as it falls into the pallets. You wouldn’t think you’d lose that much, right? NOT covering the pallets with another tarp leads to a LOT of wasted hay! By the time I cleaned out the area, I had collected SIX wheelbarrows of old hay! I don’t know how much you’re paying for hay, but at $15/bale that’s way too much wasted hay for me. I was able to throw 2 wheelbarrows out into the field for them to pick through (not their sole source of food, they still had fresh hay in their feeders) but the other 4 barrow-loads were too damp/moldy and went straight into the manure pit. 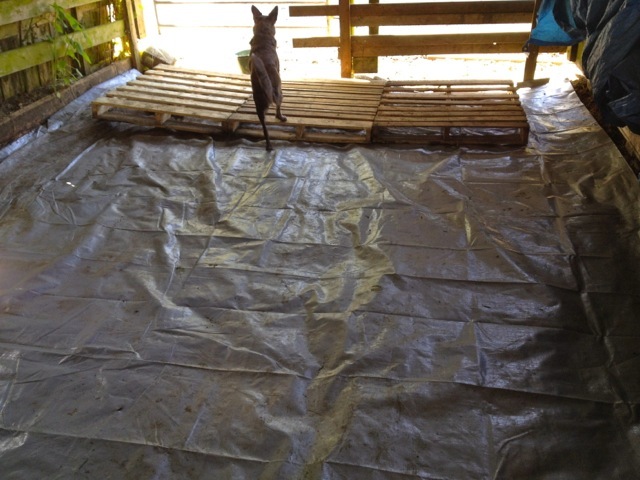 So that’s why it is much better to cover your pallets with a second tarp! 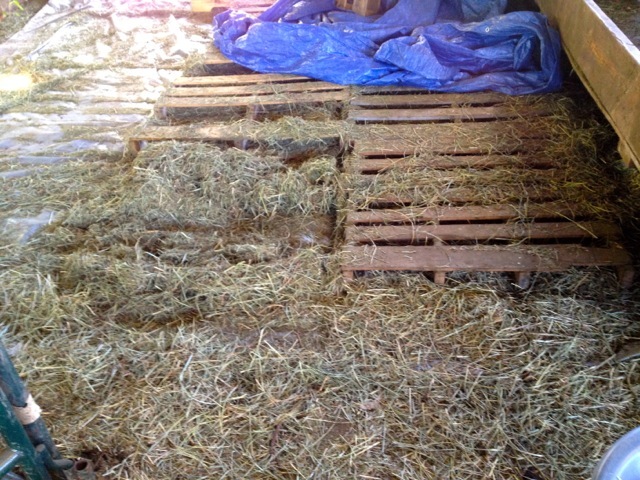 When you set up your hay storage like this, you do not have to do a big clear-out every few months to get rid of accumulating moldy hay. You simply sweep your top tarp and the edges of your bottom tarp clean, and you’re ready to stack your next load of hay. If you don’t have any pallets, you can usually get them very cheaply from hay dealers, or warehouses, or large grocery stores. I get my pallets from a local hay seller (Vanderveen Hay Sales) for $2.50 each. I have also picked them up free from companies that sell tiles for kitchens or bathrooms. Just make sure they are made from untreated wood, so you don’t poison your feed supply! Note: If your hay stack is open on all sides (pole barn) or has no roof, then see my other post for hay storage/tarping solutions that work in those conditions. 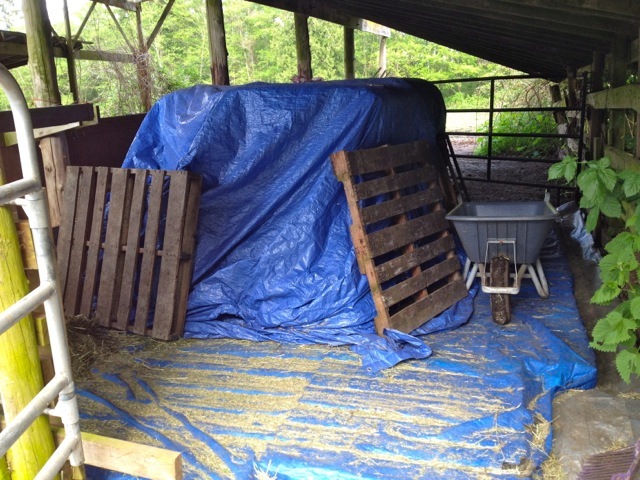 I know, that’s what I had heard and thus I didn’t cover the pallets with a tarp in my first experiments – and you can see how that didn’t work too well! A guy I know (who doesn’t have a tractor) rolls the round bales with his girlfriend’s help out to the horses, but don’t know if that would work for you. Let us know if you figure anything out. Sounds like an excellent system. I have 1 question. What are tarps made from? I hope to be wrong on this. I think that they’re vinyl. Is that correct? If so, there’s potential for toxic infiltration. 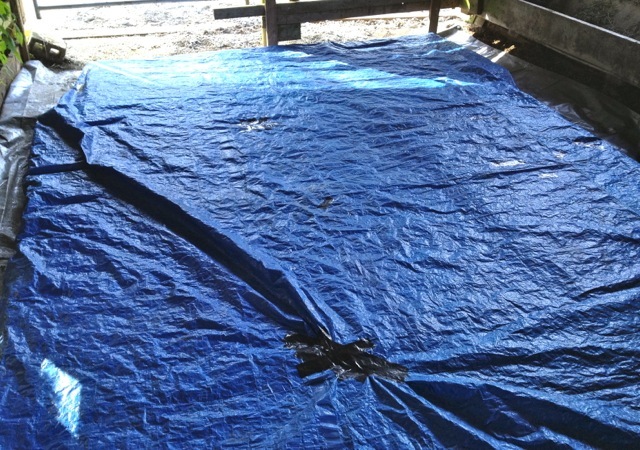 Last week, I opened a new tarp to cover my wood supply. The fumes nearly knocked me out. Have had moderate NS sx since. 3-days post exposure and all I can handle is sitting by the fire with purring cats. Not that this is bad, I would just prefer to do it by choice. You can get canvas tarps from online tarp stores but they are more expensive. I hung mine on the fence for a few days and that seems to offgas them pretty well. With your sensitivies you may want to invest in a good quality filtration mask for everything not 100% natural. These ones I had to get in a rush, but when I buy new ones I’m going to get the canvas for sure. In the meantime, I’m repairing these for as long as possible or will try to use them elsewhere to keep them out of a landfill! I store my round bales inside on concrete floor, right down the middle of my barn. I have trouble rolling them, so I sit them up on their end, when I get them fresh from the fields. Will this cause more moisture wicking then if I left them on their sides. I can store more round bales when I sit them up on their ends, and I don’t have to move them as I use them, I just fork off hay as they sit up. Also should I leave room in between each bale when I sit them up. I just bought this barn, and in the past I only used square bales and they were stored in the loft at the old barn. This barn does not have a loft for hay storage. I’m trying to get enough hay in the barn for all year. We get a lot of snow here, and my farmer does not have an area to keep the hay under cover. Make sure the hay is dry enough – otherwise store it outside or under a tarp. Make sure roof height is adequate to store the number of levels of bales you wish to store (typically 3-high). Nothing is more frustrating than trying to get that top row of bales into a tight space. Storing bales on their flat side will increase the capacity of the barn by about 10-15 percent. Provide adequate ventilation. Good hay is typically stored at 15 to 16 percent moisture and cures to 12-13 percent. For every 10 tons stored, 600 pounds of water must be removed by ventilation. 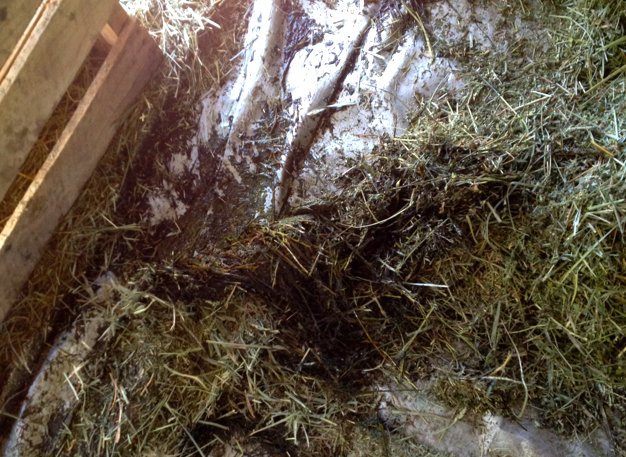 Lack of ventilation can cause condensation on the metal roof, ruin the hay and cause damage to the barn. Make sure gable ends are vented (or better yet, open) and ridge vents will give additional benefits. Thank you very much that sounds like good information.